Easter Sunday 2013 sees the start of a new BBC One period drama, The Village, charting the history of life in the Derbyshire countryside during the 20th century. The Village stars John Simm and Maxine Peake as John and Grace Middleton, an impoverished couple trying to bring up a family on a farm in the early 20th century against the background of the First World War and great social change. The story is told through the eyes of their 12-year-old son Bert. The first six episodes cover the years 1914 to 1920 and the BBC has plans to continue the show to cover the rest of the century. The BBC has set itself the task of a historical drama that will cover the life of one village throughout the 20th century. Starting on BBC One on Easter Sunday (31 March 2013), the first six episodes of The Village will look at the years from 1914 to 1920, in which Bert Middleton (played by Bill Jones) is growing up in poverty on a Derbyshire farm. These were major years in British history with the First World War and the growth of revolutionary workers movements in Britain and across Europe. These events will be covered but from the eyes of the villagers, showing how they affected ordinary life far from the action. Bert’s parents John and Grace (played by John Simm and Maxine Peake) are struggling financially. John is proud and sometimes violent and Grace tries to protect her family. If the show is successful, the BBC plans to continue it through the years with more than forty episodes already penned in. John Simm is best known for playing Sam Tyler in Life on Mars (which earned him a Bafta nomination) and The Master in Doctor Who, but his career dates back to 1993 when he played Posh Robert in the TV series Oasis. Other roles include Kendle Bains in Men of the World, Danny Kavanagh in The Lakes, Cal McCaffrey in State of Play and Edward Sexby in The Devil’s Whore. More recently, he was Baxter in Mad Dogs and Tom Ronstadt in Exile (another Bafta nomination). Bolton-born actress Maxine Peake had a Bafta nomination for her role as Joan Le Mesurier in the 2008 TV movie Hancock & Joan but her first major role was that of Twinkle in the 1998 series Dinnerladies. She went on to play Ruby Ruggles in The Way We Live Now, Janice in Early Doors and, notably, Veronica in Shameless. More recently, she was Elizabeth Lilburne in The Devil’s Whore, Miss Wade in Little Dorrit, Juliet Miller in Criminal Justice and Martha Costello in Silk. Nico Mirallegro plays Bert’s older brother Joe. Local MP Edmund Allingham is played by Rupert Evans, his unbalanced sister Caro by Emily Beecham and brother George by Augustus Prew. Their mother is Lady Clem Allingham, played by Juliet Stevenson, and their father Lord Allingham, played by Kit Jackson. Charlie Murphy plays Martha Lane, who arrives on the first bus ever to stop at the village and has an immediate impact on Bert. Also in The Village are Anthony Flanagan, Annabelle Apsion, Joe Armstrong, Matt Stokoe, Stephen Walters, Amelia Young, Katherine Dow Blyton, Ainsley Howard, Luke Williams, Jim Cartwright, Chloe Harris, Margaret Jackman, Joe Duttine, Paul Warriner, John Paul Hurley, Jonny Phillips and Scott Handy. When Bert becomes a teenager, his role is taken over by Alfie Stewart. David Ryall plays Bert as an old man in present day Britain. Written by Peter Moffat, The Village was commissioned by Ben Stephenson, controller of BBC drama commissioning, and Danny Cohen, controller of BBC One. It was made by Company Pictures and directed by Antonia Bird (episodes one to four) and Gillies MacKinnon (episodes five and six). The show was produced by Emma Burge. The executive producers were John Griffin, George Faber and Charles Pattinson for Company Pictures, Polly Hill for the BBC and Peter Moffat. 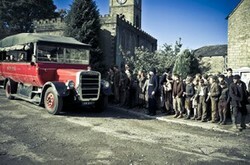 It was filmed on location in the Peak District. This looks quite good. I may be tempted by it. Thanks for the heads up! As long as he can keep regenerating, the Doctor can now live forever. But for much of his 50 years on our screens, he wasn't that immortal. Lewis episodes have aired, and the series is at its end. At least for the moment. But hints are out there, and the story line has left some loose ends.